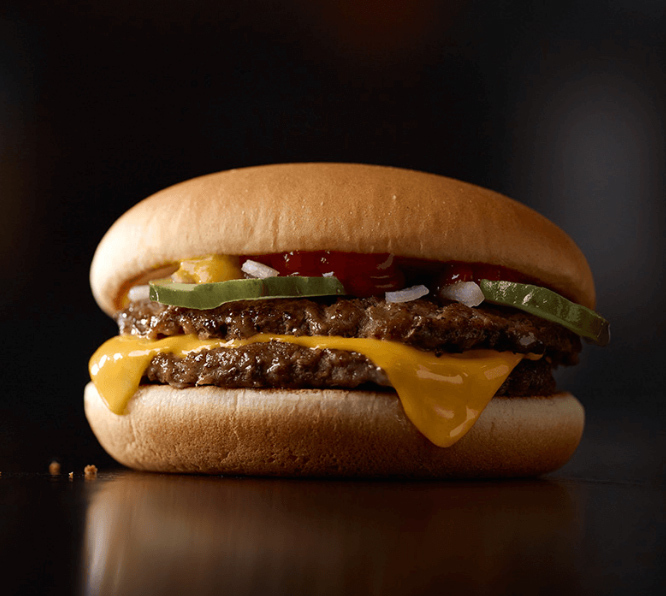 If you’re looking to go save on a burger at McDonald’s, here is a list of McDonald’s Top 5 cheapest burgers by price in Canada. The Top 10 is based on a price list of McDonald’s menu items that I compiled here. These burgers are not customized and are regular priced in Canadian Dollars. Seasonal items or limited time only items are excluded. 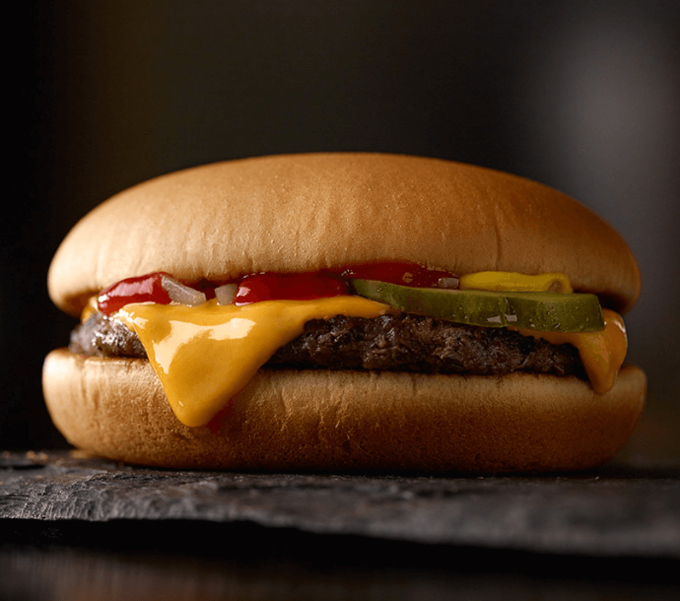 If you’re looking to splurge, check out my list on McDonald’s Top 10 Most Expensive Burgers. If you’re looking to go splurge on a burger at McDonald’s, here is a list of McDonald’s Top 10 Most Expensive burgers in Canada. 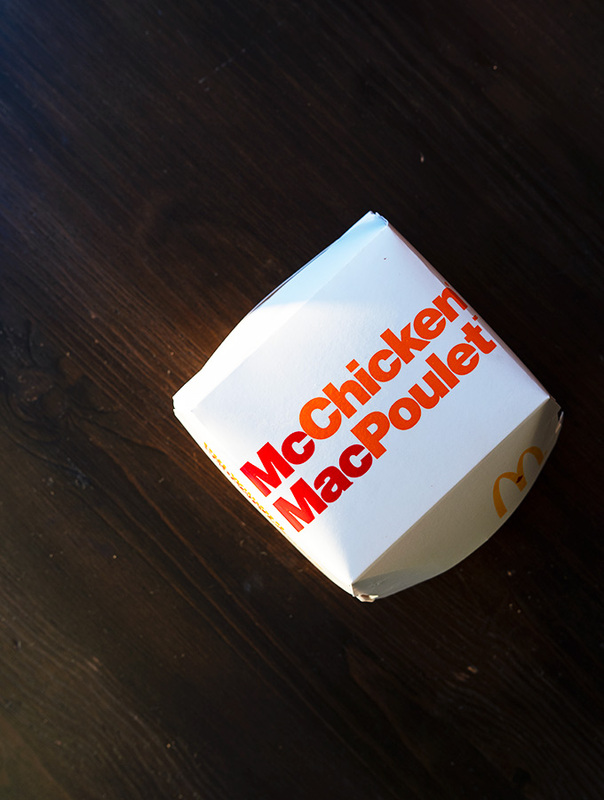 McDonald’s Canada launched three limited-time only spicy versions of the iconic McChicken sandwich available until March 11. These are the Jalapeño Pepper, Habanero Pepper and Ghost Pepper. 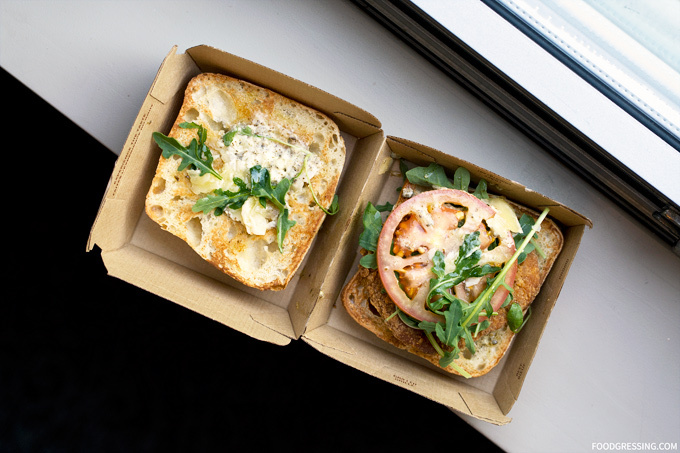 The sandwiches were launched at different two-week intervals starting with the Jalapeño McChicken (January 29 – March 11), Habanero McChicken (February 12 – March 11), and Ghost Pepper McChicken (February 26 – March 11). 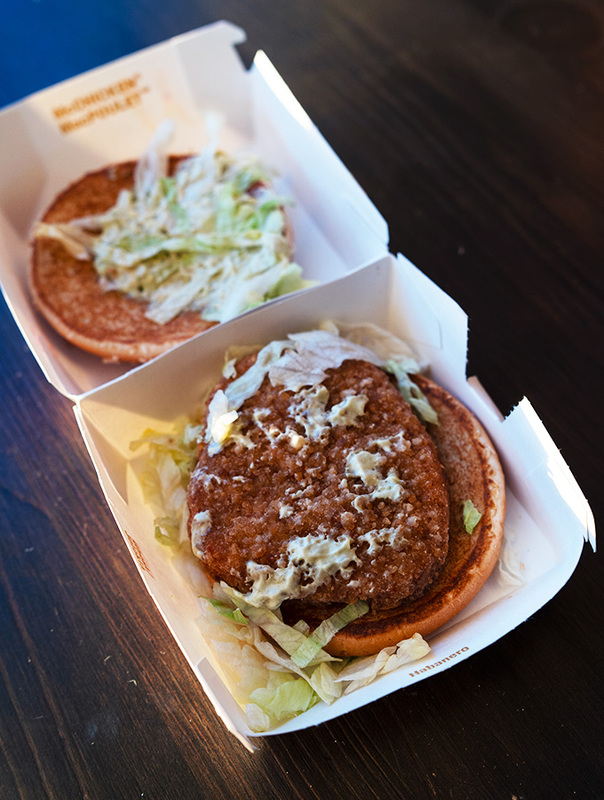 The McChickens were made spicy through new spicy mayonnaise sauces created by McDonald’s chefs and Chef Joseph Jorvath from McDonald’s supplier Flavour Reddy Foods. These spicy sauces replace the regular non-spicy mayonnaise in the McChicken. The spiciness level is measured in Scoville Heat Units (SHU) with the higher the units the more spiciness. The Ghost Pepper is essentially 10x more spicy than the Habanero. From a nutrition standpoint, all the McChickens are pretty comparable. This is not surprising considering the only change to the sandwiches were the sauces. The most obvious difference is that the Habanero and Ghost Pepper have more sodium than the regular McChicken. All the spicy McChickens are $5.69 for the sandwich or make it a meal for $9.09. They’re just $0.30 more than a regular McChicken is $5.39. This is based on Vancouver, Canada pricing. I tried only the Jalapeno McChicken which features a green colour jalapeno sauce (the Habanero and Ghost Pepper sauces are orange). I thought it had a nice spicy kick to it but not too offensive for the untrained palette. For true pepper heads, I think the Habanero would be more satisfying. And perhaps if you have a good cry, the Ghost Pepper would be up your alley. 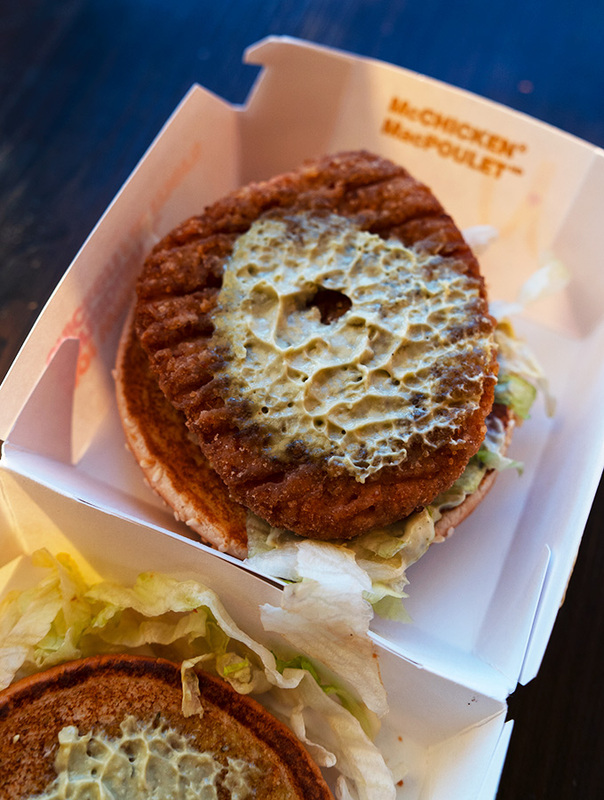 Have you tried any of the new spicy McChicken sandwiches? Let me know in the comments below. 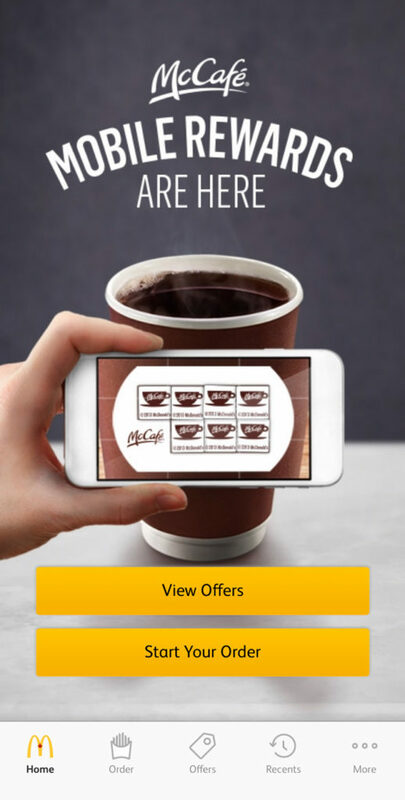 McDonalds McCafé rewards are now available on your smartphone through the My McD’s App! 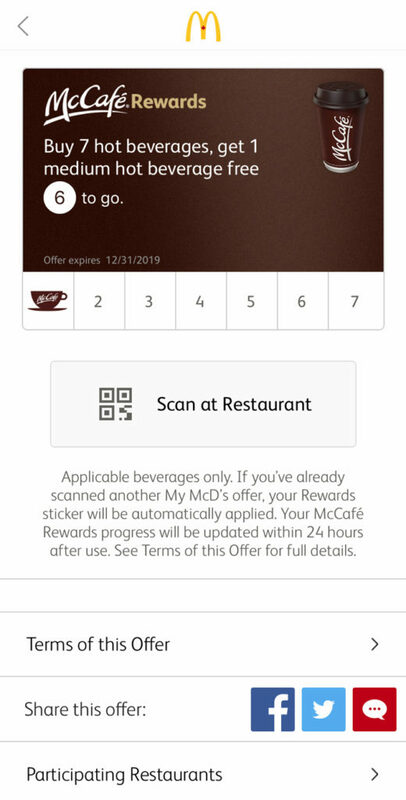 McCafé Mobile Rewards won’t be replacing the on-cup rewards stickersbut provides a new digital option for collecting hot beverage rewards. Guests will be able to collect Mobile Rewards by scanning the McCafé Mobile Rewards Card or another Mobile Offer in-restaurant, drive thru, or kiosk, or by placing a Mobile Order with an applicable McCafé hot beverage in the order. Just like the on-cup stickers, when seven stickers are collected, your next hot McCafé beverage is free. In the My McD’s app, guests will receive a Mobile Offer for the free beverage. In addition, you have the opportunity to collect double the rewards with on-cup and digital stickers. With the App, you can also save your beverage order preferences, making it more convenient to place their orders. 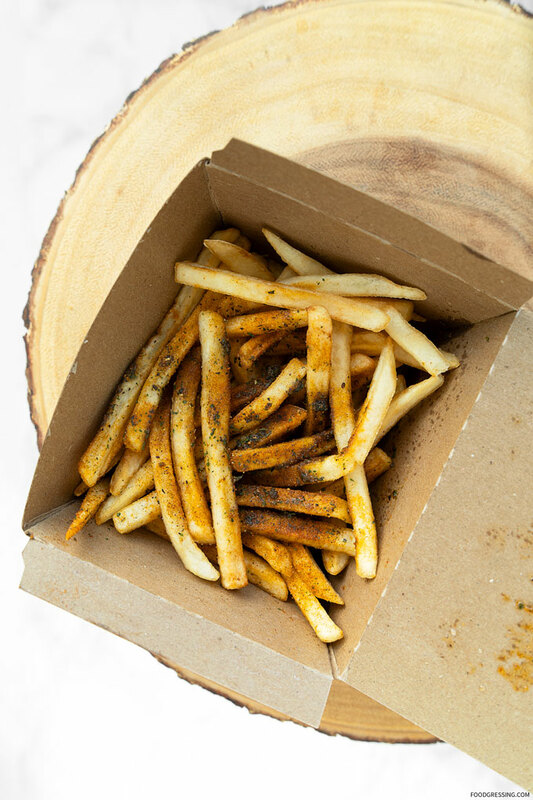 New at McDonald’s Canada this holiday season are the Herb & Garlic Seasoned Fries. According to the company, this new festive item features their world famous fries drizzled sprinkled with a festive-inspired blend of parsley, oregano, thyme, garlic and sage. How much do the Herb & Garlic Seasoned Fries cost? At my local McDonald’s in Vancouver, they are priced $3.19 and come in one size only. Based on a serving size of 121 g, the Herb & Garlic Seasoned Fries contain 420 kilocalories, 23 grams of fat, 49 grams of carbohydrates, and 330 mg of sodium. Nutritionally speaking, it is somewhere in between a medium and large fries. That is, it has less calories and so forth than a large fries but more than a medium fries. How do the Herb & Garlic Seasoned Fries taste? In general, I enjoyed this new seasoning for the fries. Last holiday season, they had the Parmesan and Garlic Fries which were OK. I definitely liked this year’s more “herbal” flavour. For me, the garlic and thyme flavours really came through. I would order this again and recommend it. I would order this again and recommend it. 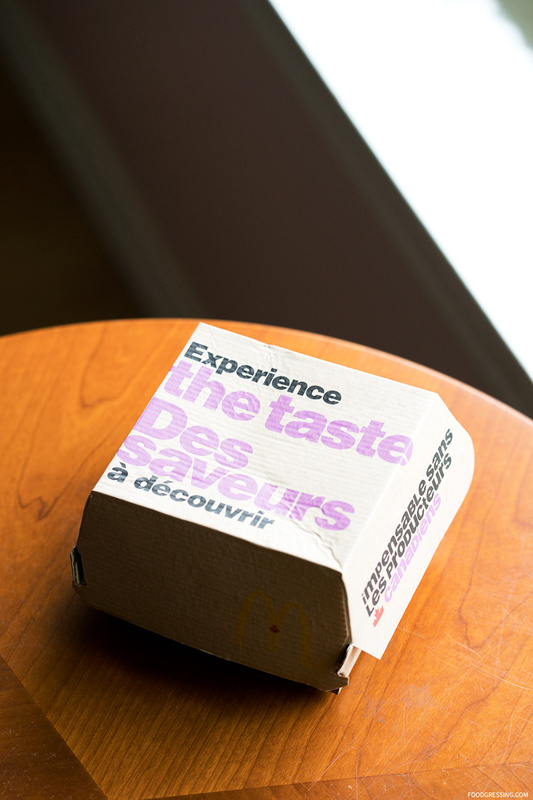 McDonald’s Canada World Taste Tour promotion is now on featuring 5 new limited-time menu items. The new items take on Chinese, Italian, Australian, French and Mexican influences and include breakfast, lunch/dinner and dessert items. I recently reviewed the McDonald’s Chinese Szechuan Burger and this time I try the Italian Pesto Chicken Sandwich (available July 2 to July 15). Here’s are my thoughts on this feature sandwich. Note: This is NOT a sponsored post. The food was not complimentary. This review is done anonymously. 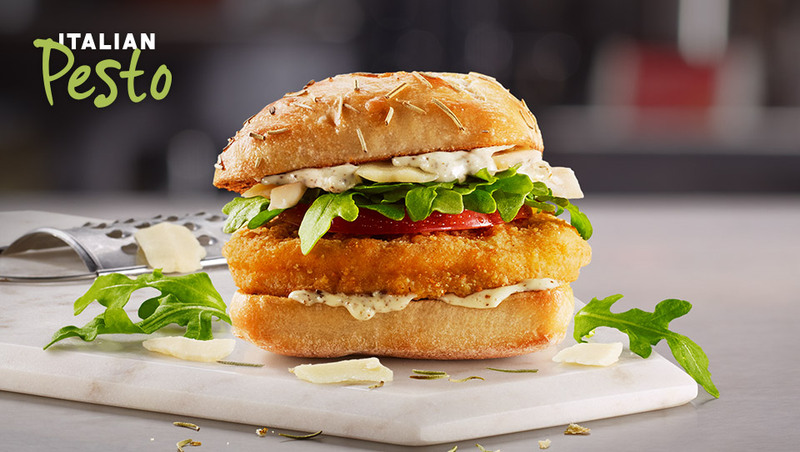 According to the company, the Italian Pesto Chicken Sandwich is made with breaded seasoned chicken raised on Canadian farms. The chicken patty is topped with a pesto aioli sauce, shaved parmesan, fresh arugula, a slice of tomato and then sandwiched between a toasted focaccia bun sprinkled with rosemary. The actual sandwich I received looked reasonably similar to the promotional photo of the sandwich. 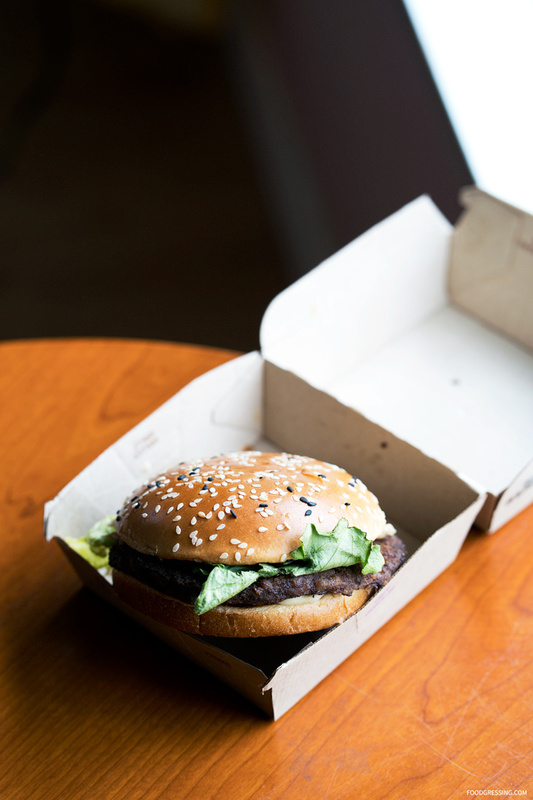 It was definitely less far off than the McDonald’s Chinese Szechuan Burger. To start, the rosemary focaccia bun was acceptably rich, chewy and crisp. The bun could be better with more toasting. The rosemary was subtle and not too overpowering. 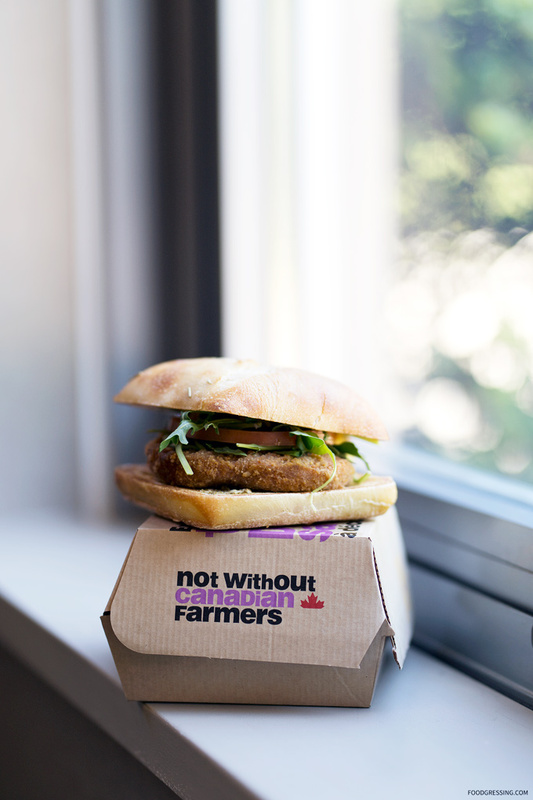 The chicken patty used in Italian Pesto Chicken Sandwich is the same one used for the McChicken. I determined this as McDonald’s had noted the chicken as “McChicken Portion” in the ingredients list for this sandwich on their website. You can expect the usual processed chicken taste as the McChicken. The Pesto Aioli Sauce was pretty good but I thought that the sandwich could use more of it. Although the sandwich has arugula, I could not taste much of the sharp, bitter flavour. 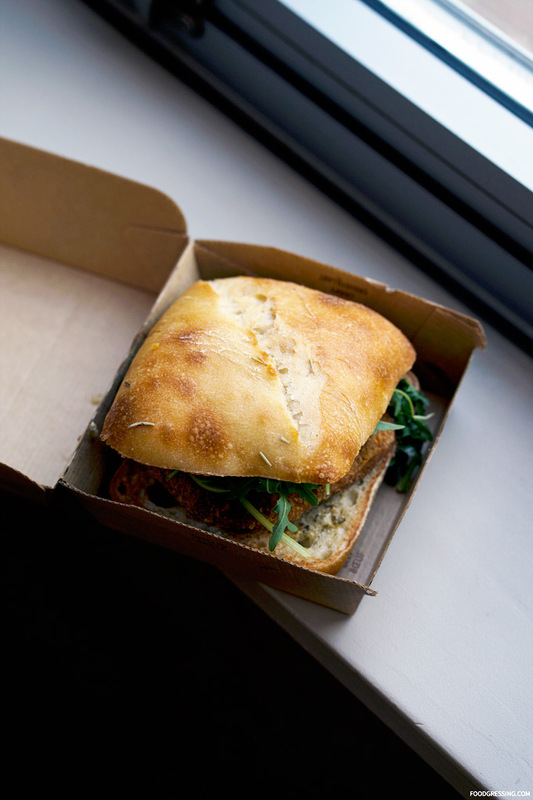 The McDonald’s Italian Pesto Chicken Sandwich has 590 calories, 33 grams of fat, 54 grams of carbohydrates, 21 grams of protein and 1010 mg of sodium. 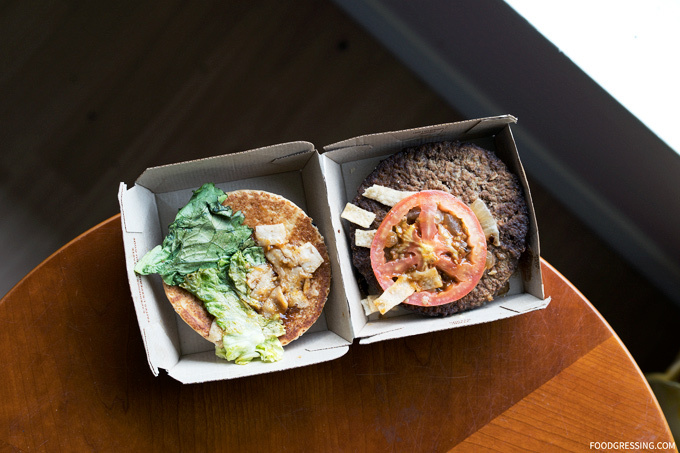 From the nutrition standpoint, it is quite similar to the McDonald’s Chinese Szechuan Burger. 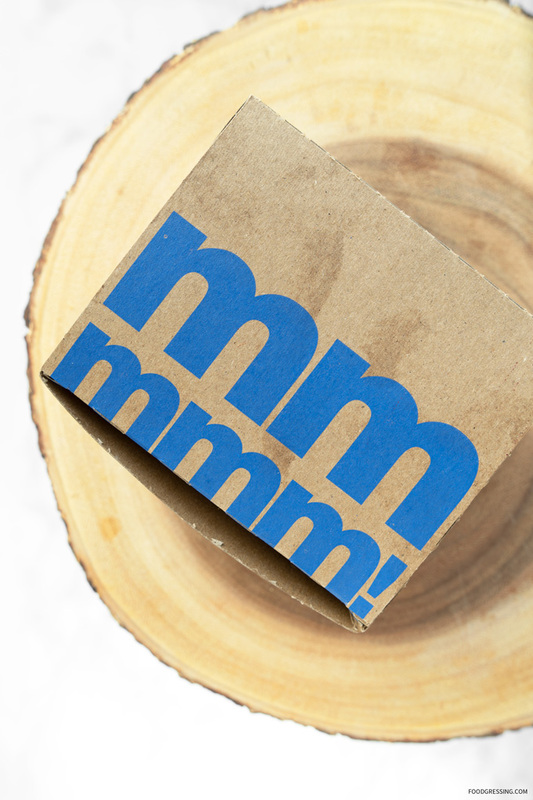 The sandwich is $5.99 on its own or you can make it a meal for $9.48. 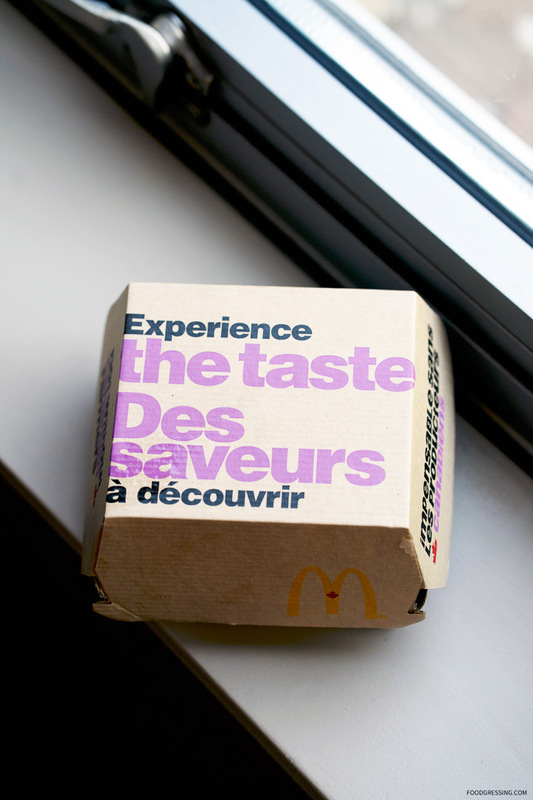 McDonald’s Canada has launched the World Taste Tour featuring 5 new limited-time menu items. The new foods take on Chinese, Italian, Australian, French and Mexican influences and include breakfast, lunch/dinner and dessert items. 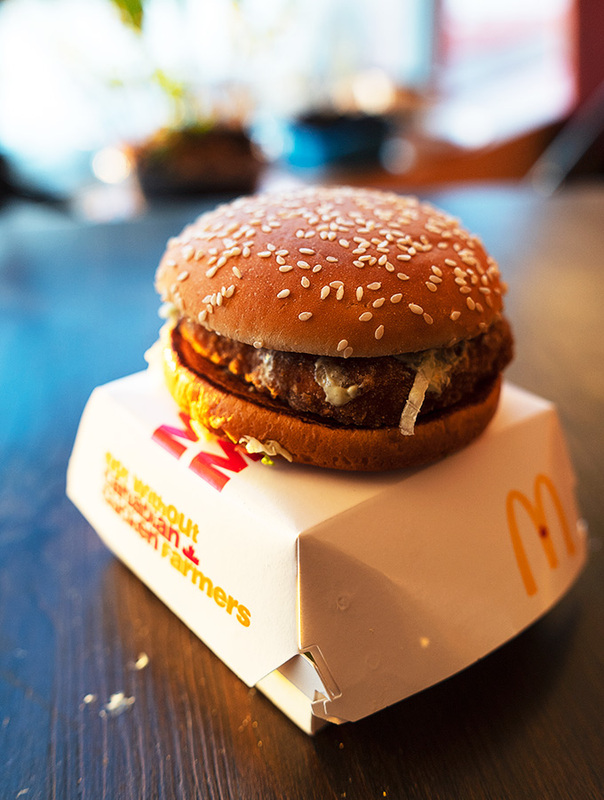 The first stop on the World Taste Tour is the McDonald’s Chinese Szechuan Burger, available from June 18 to July 1. Here’s are my thoughts on the burger. 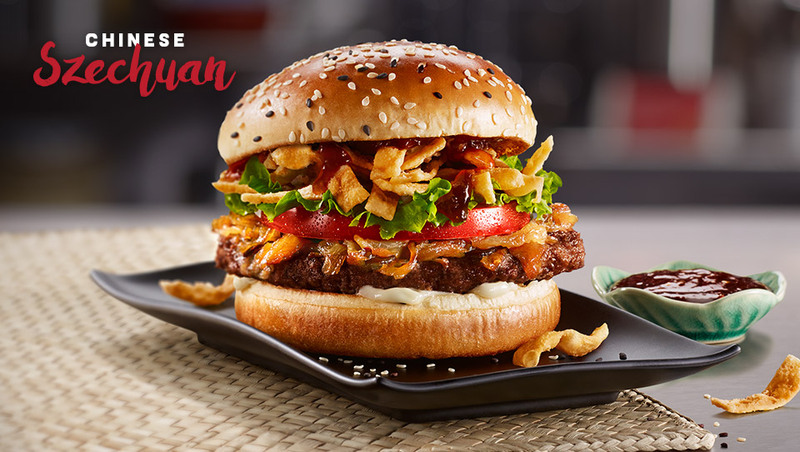 According to the company, the Chinese Szechuan Burger features Szechuan sauce and crispy wontons on a 100% Canadian beef burger. The fixings include tomato, leaf lettuce, grilled onions and mayo all which are placed between a toasted black and white sesame seed bun. 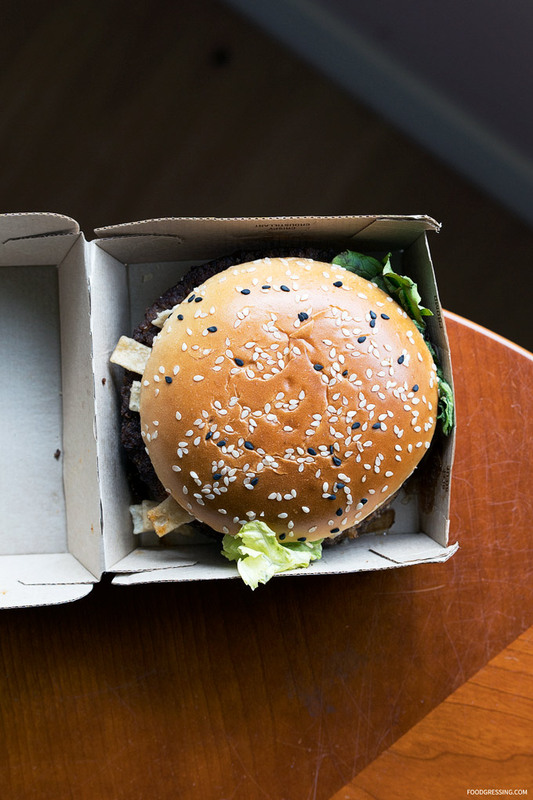 The actual Chinese Szechuan burger I received looked less stacked than the promotional photo of the burger, but that’s not surprising for marketing purposes. I felt naming the sauce “Szechuan” is a bit of a misnomer because the sauce doesn’t really have any spiciness to it like in traditional Szechuan cuisine. I found the sauce to be sweet and tangy and quite like a typical Asian sauce you would add to a salad or stir-fry. I thought the patty was pretty tasty, reasonably flavourful and tender. The black and white sesame seed brioche-style bun was very good – light, fluffy and I like the subtle nutty flavours from the seeds. The onions were nicely caramelized and the crispy wontons added some nice textural contrast. I got the burger as takeout and here is a photo of the burger after one hour in the car. 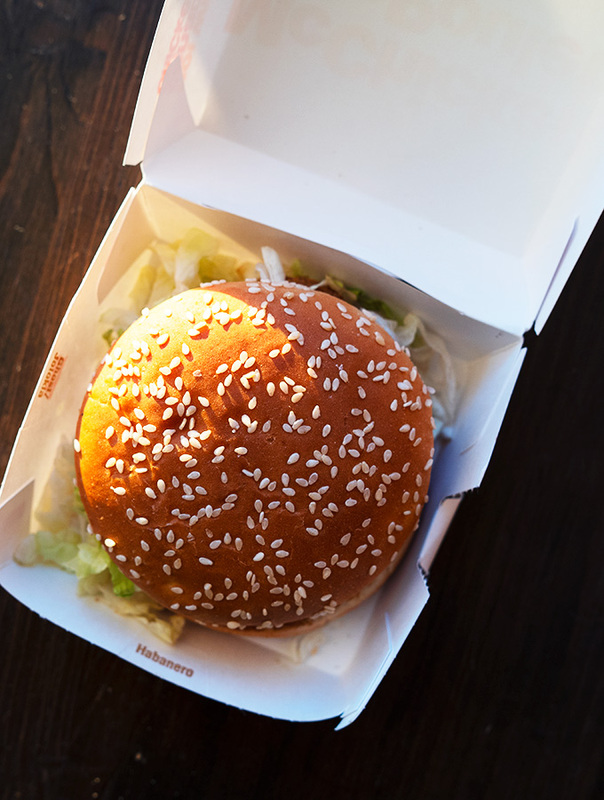 The McDonald’s Chinese Szechuan Burger has 610 calories, 33 grams of fat, 53 grams of carbohydrates, 25 grams of protein and 1030 mg of sodium. There is currently a deal at participating McDonald’s where you can get a Free Big Mac or Egg McMuffin with every $25 McDonald’s Gift Card. 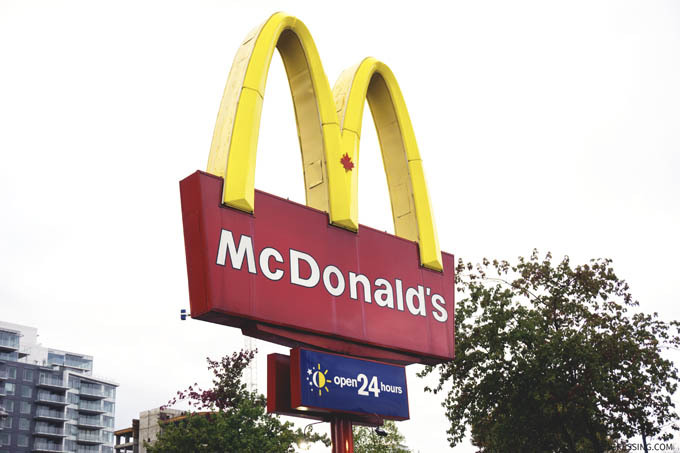 Participating McDonald’s restaurants are located in BC, Yukon, Northwest Territories, Alberta, Saskatchewan and Manitoba. The deal is available until December 24, 2017 but the coupon is redeemable from November 23, 2017 to February 28, 2018. 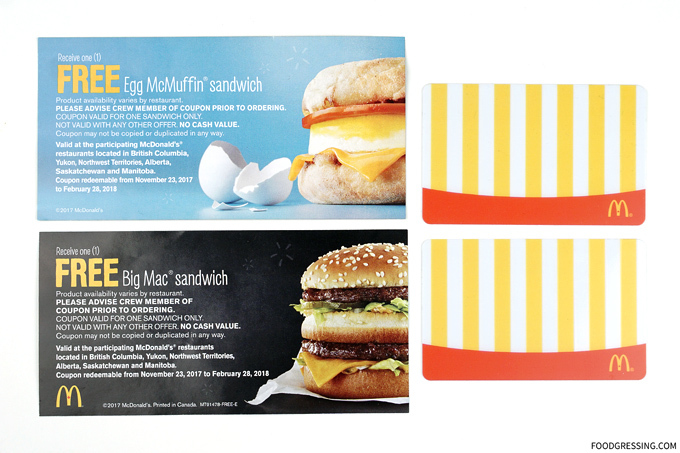 The coupon itself is double-sided so you don’t need to make a decision right away as to which freebie to get (1 side for the McMuffin and 1 side for the Big Mac). I was able to get this deal at the McDonald’s on Terminal and Main Street in Vancouver and received 2 coupons with my purchase of $50 in McDonald’s Gift Cards. If you’re a McDonald’s lover, this is a great chance to more bang for your buck! 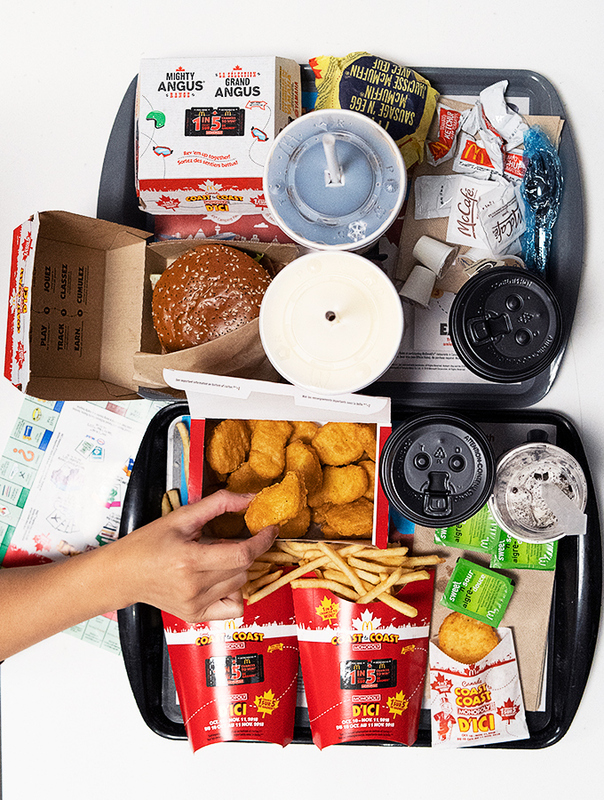 Note: This post is not sponsored by McDonald’s Canada.